Saturday October 6 from 1pm – 3pm, tickets $25. 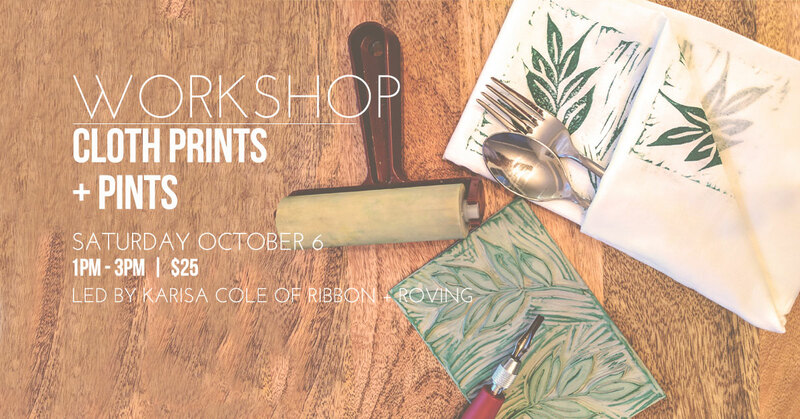 Join Karisa Cole of Ribbon + Roving during her Cloth Prints + Pints workshop in our store! Karisa will teach you how to carve a modern block stamp and print your design on a set of 4 cloth napkins! All supplies are included and you’ll get to sip on some pints from Centerpoint Brewing! This workshop is open to ages 21+, ID’s will be checked during the workshop.